As promised, we’ve started to delve into the scarier corners of the Jell-O world. This one sounded frightening to me, yes, because of the ham, but more so because of the boiled eggs. Ham is often served with sweet garnishes, but the combination of Jell-O and boiled eggs just seemed unwise. That said, the first challenge in this recipe full of challenges was picking out the ham. I stopped eating red meat when I started university in 1985, so this was my first time ever buying ham. I flirted a bit with the idea of using Spam instead of ham, which I knew I could get in a smaller quantity to minimize waste, plus it would have been amusing because for a long time Bryan’s nickname was Spam, but I couldn’t quite bring myself to do it. 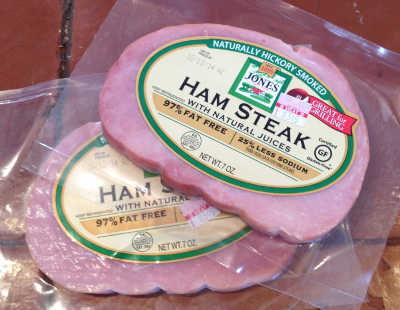 In the deli case there was a small-ish “dainty” ham marked gluten-free (why?) that looked like it might do, but there would still be leftovers. Finally, after much dithering I settled on a pair of seven-ounce ham steaks, which I reasoned would work out to about the two cups of cubed ham called for in the recipe. That was really the only thing I needed to buy, since we already had the three eggs, celery, onion, salt and vinegar at home. I also picked up one of those gadgets for neatly slicing eggs and mushroom, figuring that uniformly-sliced eggs would give me a better chance of success (still not sure how I’d define that) with this recipe. Mise en place for Molded Ham and Egg Salad. The next challenge was the timing. If I followed the recipe the thin layer in the bottom of the mold (holds the eggs in place) could set up firm enough before the “salad” layer is added that the layers might fail to adhere when the dish is unmolded. The way I did it was a little tricky, but effective. The thin layer took quite some time to firm up (I had to put it in the freezer) and while that was happening, I had the larger portion of Jell-O thickening over an ice-water bath, so that the time required for each part to set right was roughly equal. It wasn’t long after I’d laid the egg slices on the top layer that I was able to fold the chunky ingredients into the thickened gelatin and spoon that over the egg slices, finally popping the whole thing into the fridge to chill overnight. 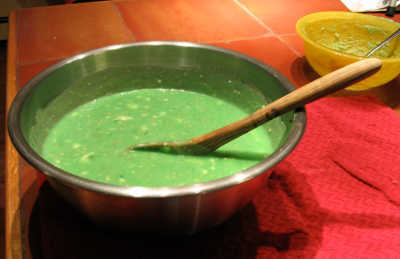 Chunky ingredients have been incorporated into the thickened lemon Jell-O. Yum! Another challenge was one I’d set for myself. From the beginning of the reboot I had been toying around with the idea of doing videos, and the current ALS charity fundraiser made this more appealing. Like a lot of people, I’m getting tired of the ice bucket thing (Benedict Cumberbatch’s adorable video notwithstanding), and I started thinking of Molded Ham and Egg Salad as another, more disagreeable sort of challenge. I charged up Bryan’s old Fuji FinePix F10 (with it’s 512MB memory card I could record up to seven whole minutes of video! ), screwed it on the tabletop tripod, and got Bryan to be my cameraman. The lighting in our kitchen is not good, so this had to be shot while the midday sun was coming in through the back windows, and that presented other lighting challenges. The recording, unmolding, cutting, still photography, and tasting all had to be coordinated, and there wasn’t much opportunity (or flash memory) for multiple video takes. I was happy, though, that I finally had a chance to get out my big bucket of army guys. 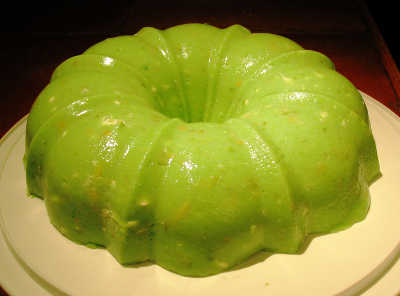 It seems appropriate that a Jell-O like this should be attacked on all sides by men with guns and grenades. You can see the unmolding in the video at the bottom of this post. It was not 100% successful. 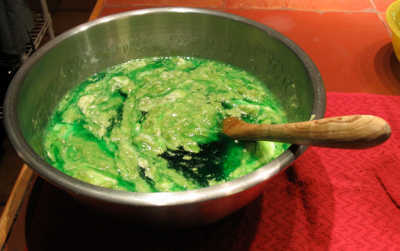 I thought I’d lubed the loaf pan pretty well with nonstick spray, but a little bit of that thin layer of lemon Jell-O stuck to the bottom. Nevertheless, the overall effect worked, with the thin boiled egg slices floating above the ham salad. Unfortunately there’s no way for me to convey to you what this smelled like, a bit sulfurous and vaguely rotten due largely to the boiled eggs which, let’s face it, never have a pleasant aroma. And then, after the still photography was done, I undertook the biggest challenge yet, actually tasting it. Folks, it was pretty much as nasty as I was expecting. 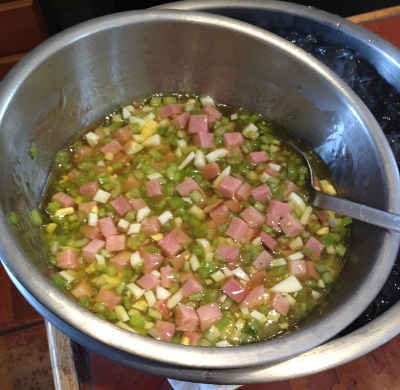 The ham tasted all right (I never was a big fan of the pig meat even as a kid), but the raw diced onion was too strong, the Jell-O was overly sweet and, frankly, slimy, and the crunch from the celery was just discordant. I managed to chew and swallow one mouthful. To my surprise, Bryan ate two, declaring it to be not as bad as Molded Tomato Relish. The final, and most difficult, challenge came when I fed the remainder (that is, most) of the Molded Ham and Egg Salad to the garbage disposal. 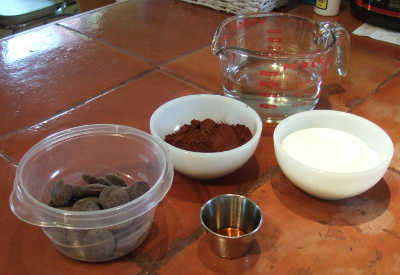 When I started the original Project, I was hoping to avoid wasting food, and initially vowed to eat everything I made. Having actually gotten through some of these recipes, I know that’s not really reasonable, but I still feel shame for dumping edible, if nasty, food. A voice in my head started chiding me about starving children in Africa, amplified by more news reports this morning about the spread of ebola in west Africa. Then at lunch today, one of my Lab mates, just back from a research trip to India, was showing us pictures he’d taken of a waste picker (a boy who didn’t know how old he was; he looked twelve or thirteen), and pictures of men working in a low-tech waste treatment facility that led some of us to thinking that there can’t possibly be many worse jobs than that. I thought of that Molded Ham and Egg Salad and felt like a first-world heel. At the back of my mind were the grumbles about the ice bucket challenge, and a topic in the reddit group /r/fitness in which a young man was proposing that the gym rats start their own challenge, a deadlift challenge raising money for another charity. It doesn’t look like they managed to hammer out details (a number of people rightly pointed out that such a challenge could lead a lot of people to hurt themselves) but I liked the concept, and after mulling over all of this, around mid-afternoon I hit upon the idea of making a charitable donation to make up for the waste of food – so that not only would I be amusing people by eating weird food, but also doing some material good. So here’s the deal. Whenever I do a particularly nasty recipe, one that will inevitably end up down the garbage grinder. I will make and post a video, and make a donation to Action Against Hunger. (I’ve already done so in honor of Molded Ham and Egg Salad.) I invite you to be my cheerleading squad. There are upwards of 20 more scary-sounding recipes to be made, and if Molded Ham and Egg Salad is any indication, I’m going to need some moral support. And here’s the video. Be nice, it’s only my second one ever. 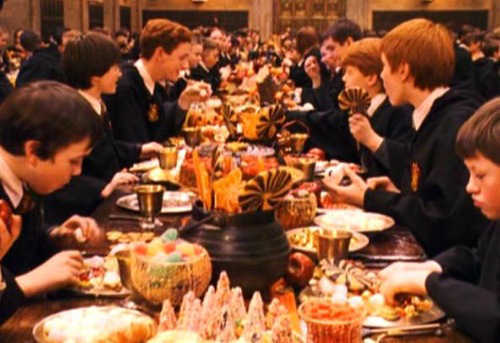 When everyone had eaten as much as they could, the remains of the food faded from the plates, leaving them sparkling clean as before. A moment later the desserts appeared. Blocks of ice cream in every flavor you could think of, apple pies, treacle tarts, chocolate eclairs and jam doughnuts, trifle, strawberries, Jell-O, rice pudding…. If it was good enough for Dumbledore, it should be good enough for you! So, I know that things probably seem pretty quiet out there on your end of New Joy of Jell-O Land, but they’re not so quiet here behind the scenes. There hasn’t really been any Jell-Oing happening these last couple of weeks, but I’m working diligently on the back end. Once that’s done, I need to start writing more Memory Lane entries to put in the hopper. I just wish I was better at writing quickly, like Jack Kerouac at the typewriter with his big roll of paper. I know that his secret was amphetamines. Considering that I’m now the age Kerouac was when he died, I suspect I may be a bit old to be a successful speed freak. Another thing I’ve decided to do is to make some effort to market this blog via social media, just to see how far I can take it. There’s a certain learning curve to this for me, since I’ve yet to get the hang of Twitter, and as of this writing I barely know what Pinterest is, but apparently I need to be using it. Having the blog syndicated via NetworkedBlogs just isn’t enough. I’m trying to do this concurrent with the Jell-O, but it’s going to require that I develop better discipline with my time. Essentially, this is going to work out to be like a real part-time job in addition to my regular day job, and the funny thing is not only do I not expect to make any money at it, it’s already costing me money. Trust me, I’m not in this for the benjamins. Nope, it’s all about the fame, baby! Ah, speaking of influences in my formative years, and speaking of joy…. Like so many people, I was stunned and saddened to learn about Robin Williams’s death by suicide on Monday. I’ve been a fan since the first appearance of Mork from Ork on “Happy Days”, and his wild, brilliant comedy not only helped me survive a difficult adolescence, but also provided weird and wonderful creative inspiration. (Jell-O, anyone?) When he wasn’t bowling you over by the force of his energy, he was blowing your mind putting together disparate elements to create a hilarious and beautifully unified whole. He was open for a long time about how some of that energy was cocaine-fueled, and about his struggles with substance abuse and depression. To me, those things make his accomplishments that much more impressive. I know how hard it is, when you’re feeling lousy and down on yourself, to just show up and function on a minimally acceptable level. Williams did whatever he had to do to be amazing – and make no mistake, that is an incredibly difficult thing to do in show business, where the glamor is heavily underpinned by a great deal of personal risk-taking and terrifying levels of vulnerability. Anybody who’s ever gotten up on a stage in front of people, even just for a high school talent show or an open mic, should be able to appreciate that. His ability to be joyful in his comedy and deeply present in his dramatic roles despite his suffering demonstrates a profound generosity of spirit. Robin Williams fought long and hard and valiantly. I’m sad that he suffered so, and deeply grateful to him for fighting. We were lucky to have him on the planet with us. My little friends made a valiant attempt to defend me from Molded Tomato Relish, to no avail. I know what you’re thinking. 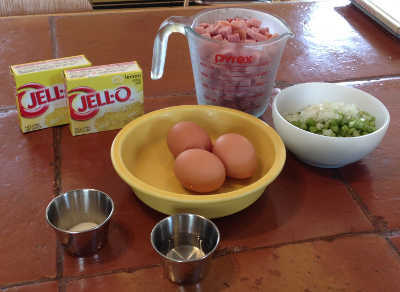 You’re thinking that I’m wimping out, that the Jell-O recipes I’ve posted so far have been entirely too palatable. 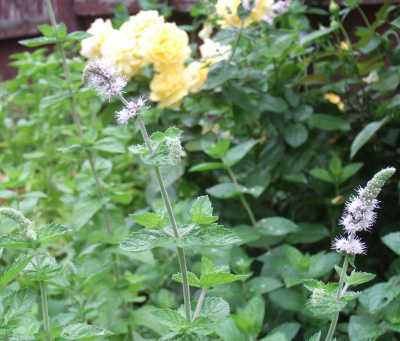 I’m under no illusions about this blog. I know that on some level it’s like the Jackass of through-cooking blogs, and what readers want to see are weird things suspended in Jell-O and detailed descriptions of my attempts to eat them. Those posts are coming, don’t worry. But first, Bryan and I are getting ourselves psyched to take them on. 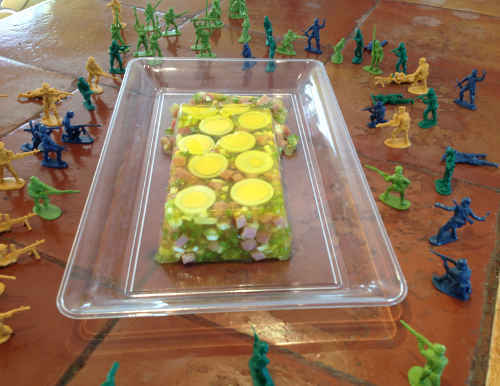 Some of the recipes in The New Joys of Jell-O really are that bad – memorably bad, PTSD bad. And that brings me to Molded Tomato Relish. 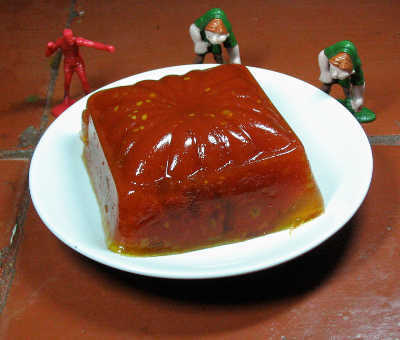 Actually, Molded Tomato Relish wasn’t all that bad (Bryan disagrees with me on this), but it happened to be the first savory Jell-O I did, so it haunts us. In a recent comment thread in my Facebook feed, in response to this (Buzzfeed, sorry) link, a friend of a friend remarked that jellied tomato actually sounds interesting. I had similar thoughts when setting out to make Molded Tomato Relish. Well, not so much “interesting”; more like “mostly harmless”. This is a simple one, combining a package of lemon (or strawberry – ick) Jell-O with a 16-ounce can of stewed tomatoes, a half teaspoon of salt, and a tablespoon of vinegar. Until I looked at the book just now, I had a vague recollection that there was some other seasoning involved, but that must have been wishful thinking. The book says to use the tomato can as a mold, but screw that. I had recently bought some new molds, and I was eager to use this one, which happened to be just the right size for this recipe. Instead of making Jell-O the usual way with water and then suspending the tomato in it, the recipe says to heat the stewed tomatoes to boiling, simmer, and then add the Jell-O powder and other ingredients. 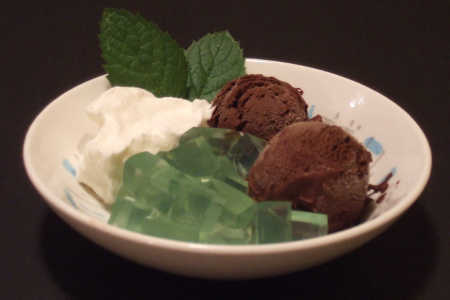 You can see in the photo that the Jell-O is much less obvious in this dish than it is in other such dishes. The main advantage to this is that it’s denser and unmolds more easily than your typical Jell-O mold, so at least it turned out looking good for the photo. Note that I set up the photo with the toys attacking the molded dish before we actually tasted it. I just thought it was funny, and did not realize how prescient this food styling decision would turn out to be. I cut small pieces for Bryan and me. We each spooned off a bit. We may have counted to three before tasting in unison. As we chewed, our faces took on perplexed expressions, and then suddenly, again in unison, we burst out laughing. It was laughter of dismay and astonishment, with perhaps a slight hysterical edge. Man, that was some bad Jell-O. I think the vinegar was supposed to cut the sweetness of the Jell-O, but it didn’t. Instead, there were three different flavors not only failing to blend together but outright refusing to get along at all. It was like the gustatory equivalent of a kung fu fight scene in a cheap Asian B-movie as featured on Uncle Morty’s Dub Shack, funny and chaotic and cringeworthy all at once. We made some pithy, disparaging comments that unfortunately neither Bryan nor I can remember now. Bryan does recall that he was going to try to salvage it somehow (this was early in the original Project, before we gave up on our rule not to waste food), but it ended up sitting in the fridge for a few weeks before we finally tossed it.